Hildegard of Bingen: The Woman of Her Age by Fiona Maddocks is a creative nonfiction work about the life of the 12th century mystic, abbess, and now saint Hildegard of Bingen. The 12th century was a very important time in the history of Western Europe and the Latin church. Scholasticism emerged at the end of the 11th century and conflicted with the older monastic theologies. The powerful and famed cistercian Bernard of Clairvaux founded monasteries, mentored a pope (Eugene III), and was influential in the careers of numerous religious and theologians. Universities also started popping up in major cities. Kings fought against the pope for more independence and power over their people. Hildegard started her life as an anchorite at the age of 8 or 12, under the direction of a girl only 4 years her senior Jutta of Sponheim. She had visions from a young age but kept them hidden for many years at the abbey of Disibodenburg. When she finally revealed them, Jutta had already died and Hildegard had been made abbess of a community of noble sisters. Over the next several decades, she founded a monastery (Rupertsburg), composed chants, and authored several books covering topics ranging from medicine to spirituality. Because she was mostly illiterate, her books were written and edited by her secretaries Volmar and (later) Guibert of Gembloux. Hildegard was not afraid to write to the Archbishop of Mainz or the pope to get what she wanted. Well-researched and in straightfoward language, Fiona Maddocks tells the story of one of the most powerful and controversial women in history – only canonized a saint in 2012 by Pope Benedict XVI. I am usually not a fan of creative nonfiction. I prefer academic works because they have a clear thesis and are peer-reviewed. 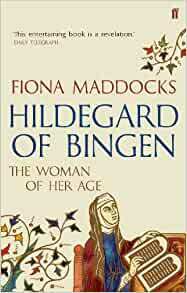 But Hildegard of Bingen: The Woman of Her Age lacked the enthusiasm I often encounter in creative nonfiction. It is not a hagiography in either the religious or the secular sense. Hildegard is portrayed with her faults and is nothing like the way she has been portrayed by feminists or New Age writers such as Matthew Fox. She was powerful but also quite conservative – holding some views that would be considered today as unacceptable in any circle. My favorite parts of the biography were the passages from Hildegard’s books and letters. I also appreciated Maddock’s commentaries about the authenticity of the source material. Maddocks does not attempt to analyze Hildegard’s visions, which would seem to be a great weakness since Hildegard is famous for her visions, but Maddocks is a Classic Music critic for the Observer, so she probably does not have the theological background to do justice to Hildegard’s visions. The sections about medicine and sexuality are so amusing. Our understanding of these fields have definitely improved a lot in the past 800 years. I have admired Hildegard of Bingen for so many years and remember being excited when she was canonized in 2012. I am glad her story is being told, and I look forward to reading soon her most important book of visions Scivias. I currently own a Hildegard of Bingen reader that I dip in and out of. Even if you are not religiously inclined, you will enjoy Hildegard of Bingen: The Woman of Her Age. It gives a good overview of her life and thought.